Sunday Funday! My favorite thing to do in the fall is spend the day in the kitchen baking, cooking and getting my family ready for the week (I know it’s crazy, but I love it) Football is on in the background, my daughter runs around giggling and laughing because daddy is home, what is better than that? Oh yes Sunday Supper! Well this week our hostess is Cindy from Cindy’s Recipes and Writings. What’s that you say? She sounds familiar? Well she is, she did a guest post for this past summer. Well Cindy was kind enough to host all of us for this weeks Sunday Supper! Guess what the theme is?? Apples Apples and more Apples my friends!! What better than a good apple dish during this time of the year! Well you’ve come to the right place because you are going to want to run to you kitchen and make one of these when you done checking out this list. What did I make? Well I decided on a side dish because it gives me a good chance to try something new on my family. Can I just tell you that these were my husbands words the second he dove in “OMG I could eat this whole dish.” Then between the two of us we almost did!! OK well he got to take leftovers to work at least! I actually got this recipe from the Weight Watchers website, I did a search for a sweet potato dish with apples and here is what I got! I cut exactly in half because I didn’t need to serve 10 people I made enough for 4 so this is what I did. 2 Medium Apples (3 if you want to munch while you slice!) it called for Golden Delicious but I used two different kinds. Peeled, cored and sliced very thin. Preheat oven to 400ºF. Place potatoes on a rimmed baking sheet and bake until very soft, about 1 hour. Remove potatoes from oven and reduce oven temperature to 350ºF. Let potatoes stand until cool enough to handle. Meanwhile, melt butter in a large nonstick skillet over medium-high heat. 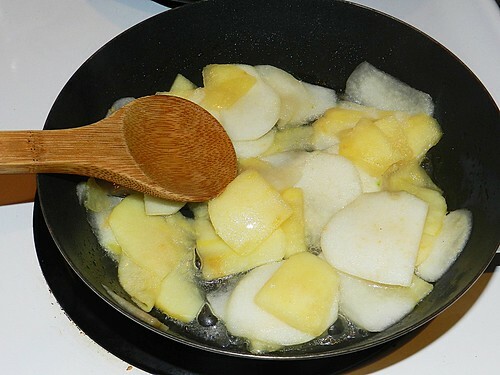 Add apples and cook, gently turning occasionally, until golden and tender, about 7 minutes; remove from heat and set aside. Cut cooled potatoes in half and scrape out pulp into a large bowl; discard skins. Add juice, salt, nutmeg, cinnamon and pepper; mash with a potato masher. Lightly coat a 1 1/2- to 2-quart rectangular or round baking dish with cooking spray. Funny side story, I almost forgot the spray! I had to take the potatoes out, rinse the dish, and spray it. Crisis averted! Scrape potato mixture into baking dish; arrange sautéed apples over top in pretty pattern. Bake until bubbly around edges, about 30 minutes. Sprinkle with ground cinnamon (I used pepper at this point because I knew it would be sweet between the sweet potatoes and apples, I wanted to offset some of the sweetness. I did. I think it’s a great dish, different from the normal mash potato or rice dish, plus as far as I know sweet potatoes are healthier so I’ll take it! What is that you ask? What’s is the recipe for that awesome steak you see there? Oh that’s Here! You can assemble this dish up to 4 hours in advance (up to the point of baking it). Keep it refrigerated but let it come to room temperature before cooking it. This is what I did. I was babysitting for a friend of mine that afternoon so first thing in the morning I made my sweet potatoes, and left it right on the counter until I was ready to mash. I made the mash later on in the afternoon during nap time and put it in the fridge along with the sliced apples (I put them in water so they wouldn’t brown). When I went to make dinner, I took the dish out, sauteed the apples in butter placed them on top and and stuck it in the oven and made the rest of my dinner 🙂 You could probably make this with Yams as well. OK one more for the road. So grab yourself a cup of coffee (or glass of wine) and start pinning, taking note or bookmarking these lovelies!! Please be sure you join us on Twitter throughout the day during #SundaySupper. We’ll be meeting up at 7:00 pm (Eastern) for our weekly #SundaySupper live chat where we’ll talk about our favorite apple recipes! All you have to do is follow the #SundaySupper hashtag, or you can follow us through TweetChat! We’d also love to feature your apple recipes on our #SundaySupper Pinterest board and share them with all of our followers! Hmmm….the apples on top of the sweet potatoes sound so interesting. I’ve had a crunchy pecan topping on sweet potatoes before but not apples. I’m intrigued. Sounds delish for sure. Apples and sweet potatoes – now that is a delicious combo!!! apples and sweet potatoes – what a fabulous combination! very unique and delicious recipe. I love mashed sweet potatoes! These look scrumptious. Happy #SS! I hope you saved me my serving because I’m on my way. Saving this one for Thanksgiving! Yeah! Another great side for Thanksgiving! 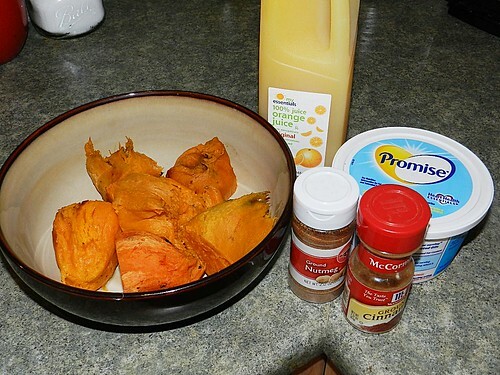 Wonderful idea for sweet potatoes with the orange juice and apples! A nice change from the regular side dishes. I have had apples with, in and on top of sweet potatoes and it really adds to the whole experience. Yum! I love mashed sweets apples can only make it better! Oh my goodness Momma, this looks FANTASTIC! Right up my alley and a few of my kiddo’s will totally eat this. We are making this soon! Great choice! 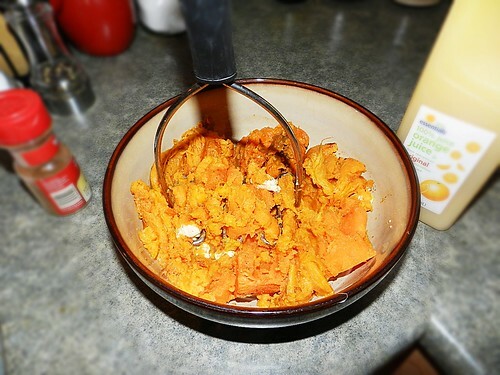 Great idea to add some extra texture to sweet potatoes. Beautiful dish! I just love sweet potatoes–this could be a new side for our turkey day feast! This look so fabulous! 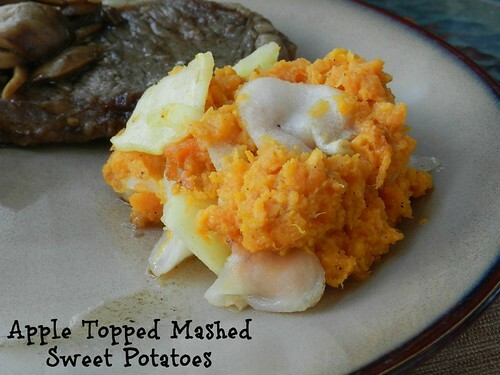 What a fun change to mashed sweet potatoes! Nice! We always do candied pecans on top of our sweet potato casserole but I may think of trying this topping out instead to change things up a bit. I would have never thought to do this! I seriously love sweet potatoes, your recipe looks great!!! Sweet potatoes and apples are a great combo!! Love the idea!! Okay seriously, this is freaking cool. I need to add more sweet potatoes to our diet. This looks like a great way to do it! 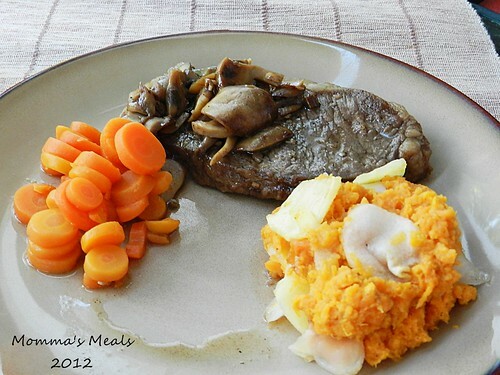 A wonderful twist on mashed sweet potatoes. I bet the apples give a lovely sweet tart kick to the dish. Mashed sweet potatoes sounds great! Will add in my trial list. Thanks for sharing. Great idea of combining apples and sweet potatoes :)I love this recipe and will be making this for sure :)Thanks so much for a lovely recipe! That looks like it would make a great dessert too! This is SO much better than topping sweet potatoes with marshmallows!!! What a yummy dish!!! My mouth was open the entire time I was reading this post. I think I may have drooled a bit too. I LOVE sweet potato mash and the apples are such a perfect fit. I could probably just eat a mountain of the mash for dinner and call it a day! What a great way to serve apples. I bet they taste great with sweet potatoes. Wow ! What an innovative way to serve sweet potatoes !! Yummm ! Will be making this for thanksgiving this year 🙂 Thanks for sharing ! 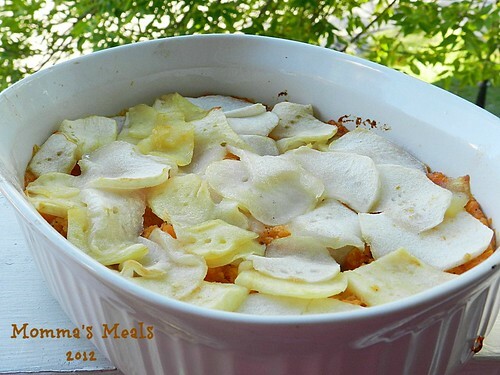 What a great way to use apples and sweet potatoes together. I never would have compe up with this combination but wow! what a great side dish. It’s not often that I use apples in a side dish, but seeing them with sweet potatoes has me thinking this is a great way to have them!